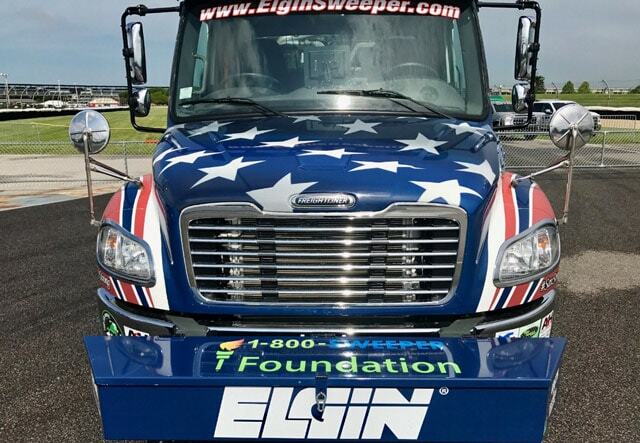 Elgin Sweeper, the Official Sweeper of NASCAR Green is showing support for the 1-800-SWEEPER Foundation. This summer, Elgin added the Foundation’s logo prominently on the front bumper toolbox of the Elgin Crosswind Specialty Track Sweeper. In February 2017, Elgin renewed its partnership with NASCAR Green™ for three years continuing to serve as the Official Sweeper of NASCAR Green. For this reason, Elgin’s tie-in to the 1-800-SWEEPER Foundation is a natural fit. The 1-800-SWEEPER Foundation was created in 2016 to help local areas across the United States clean up following natural disasters, and contribute to qualified environmental and community beautification initiatives. The foundation also helps support local Wounded Warriors programs. Elgin Sweepers are an essential part of keeping NASCAR events safe by maintaining a clean and dry racetrack surface. 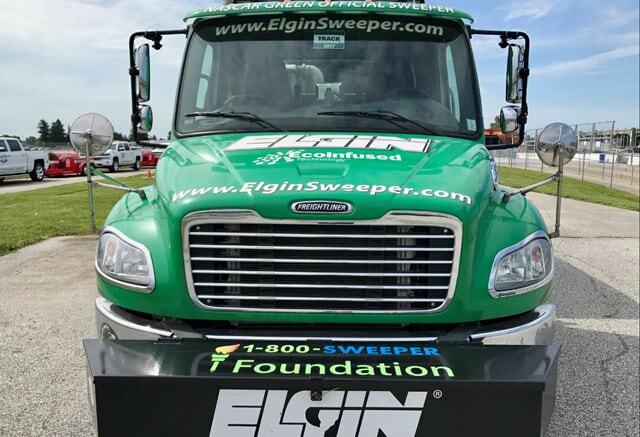 As the Official Sweeper of NASCAR Green, Elgin Sweeper is present at each NASCAR race event weekend to support NASCAR’s Air Titan equipment to dry rain-soaked racetracks, saving jet fuel and reducing NASCAR’s overall carbon footprint. Ultimately, Elgin Sweepers help the track operators return to green flag racing as quickly and efficiently as possible. During the 2016 NASCAR race season, the Elgin Track Sweeper helped with drying rain-soaked tracks and vacuuming up standing water, rubber and debris around the pit area at 76 races of the NASCAR Cup Series and more than 200 practice sessions. Many thanks to Mike Higgins, vice president and general manager of Elgin Sweeper for his help in moving this partnership between Elgin and the 1-800-SWEEPER Foundation forward.